You remember, if you are old enough, the Jetsons? The futuristic space age cartoon family living in kind of early 1960’s vision of a future full of automation where small doors always seemed to slide open and a claw hands the needed item out in finished form. If George Jetson needed a fast divorce I would wager a guess he would command his robot maid, Rosie, and the door on her stomach would open and a claw arm would hand him a final divorce decree. Embedded in this comic vision of life in the future was two ideas that are constant factors in commercial evolution: speed and convenience. These factors are equally present in the evolution of legal services. As the maturity of the internet has applied greater pressure on all types of businesses. so too has the net’s driving force been felt in law offices. How do we make the law more accessible to everyone, primarily the underserved? How do we make the law more convenient, easier to understand, and affordable? The concept of the traditional law firm, where you make an appointment and visit an attorney in his office for a consultation is changing, perhaps not quickly enough. Not only is there a need for greater access to the law and legal services but a great need for more simplified processes for consumer law issues. But is there a market? According to the Brennan Center for Justice at New York University School of Law, there is a “Crisis of Access” to legal services and resources. “Eighty percent of low income people have trouble obtaining legal representation or otherwise accessing the civil court system to protect their property, family, and livelihood,” according to their website. As you might imagine the access issues go down as you go up the economic scale but it is still dramatic no matter what your income level. This dilemma is a double-edged sword for the American legal system. With affordability a key consideration, a large part of the population is faced with either foregoing the use of the legal system to defend or enforce their right or navigate the labyrinth without counsel. In recent years the number of self-represented civil litigants has been steadily rising and blocking up court dockets. Additionally, research into landlord tenant cases proved a clear disadvantage exists to unrepresented parties. What is the answer? In short, I believe there is an agreement that the legal system needs to reevaluate restrictions and constraints on attorneys to lower the risks and requirements that translate into higher costs to operate a law firm. The high cost of malpractice insurance, high cost of qualified labor, cost of office overhead, etc., all contribute to determining the cost of legal services. But also the traditional model of delivering legal services needs to be redesigned. Equally important as the redesign is the need for acceptance by the courts, bar associations, and attorneys of new channels and means to deliver legal services. Only with both a better model and acceptance of new ideas for delivery by the courts will greater access to justice be available. How long will this take, you ask? We are in the midst of these new models being introduced. Legal Zoom is one of the more well known internet legal providers. Yet, unfortunately a completely internet reliant legal options leaves a lot to be desired. Personal interaction, local legal knowledge, etc. are wanting for many considering the internet option. The American legal system is in need of a bridge between the traditional law model and the pure internet model. What will it be? Should access to legal help be available in a store such as Walmart or Target? Is the public ready for a retail law store model where they can shop for their legal needs like you shop for groceries? As with other areas of commerce, the law and courts do not push change. Ideas and innovation push change. And change can be slow especially in the law. So it is unlikely that you will be served paper by Rosie the robot in the near future. However, change is upon us and well=needed. 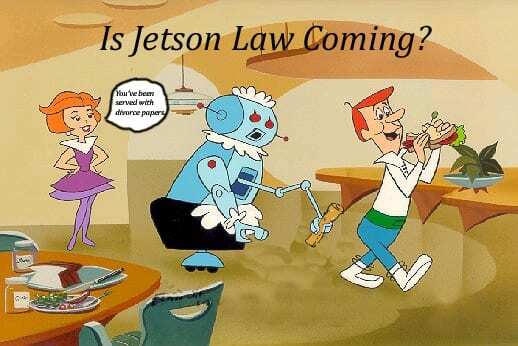 The era of Jetson law may not be as far away as we think.